Teacher Recruitment Test in School Education Department School Assistants Phy.Edn /SA Physical Education Teachers Online Applications are invited Online from qualified candidates through the proforma Application to be made available on Commission’s WEBSITE (www.tspsc.gov.in) to the post of SA Physical Education Teachers in School Education Department. 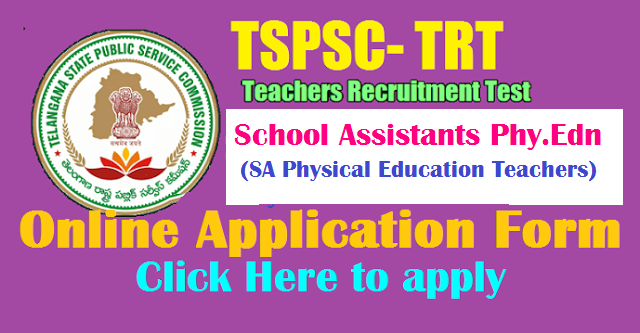 TSPSC School Assistants Phy.Edn /SA Physical Education Teachers Recruitment Test(TRT) 2017 Notification, TS DSC Exam dates, Last date to apply, Online application form, exam fee/application fee details, Hall tickets, Exam date, Recruitment test Schedule, TSPSC SGT Teachers Recruitment Eligibility Criteria/ Post wise Qualifications, How to Apply-Apply online-User Guide for TSPSC School Assistants Phy.Edn /SA Physical Education Teachers Teachers Recruitment test Details are given here. Sl. No. Name of the Post No. of Vacancies Age as on01/07/2017Min. Max. Scale of PayRs. TS TRT(DSC) 2017 Online applications available from 01-Nov-2017.